Blog | How Does Weather Affect Different Gate Materials? When choosing between different materials for a residential gate installation, it’s important to know what you’re getting yourself into. Since your whole system is outside, the weather has a cumulative effect on it. Different materials react in different ways. Here’s a little glimpse on what you can expect in extreme weather conditions of all kinds. Wood is perhaps the most popular material, but be prepared for a host of weather-related problems. 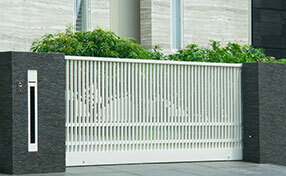 Pressure-treated wood – which you should ask about, if only to make sure your potential system doesn’t include it – warps terribly, and since gates have to be precisely aligned in order to open and close correctly, pressure-treated wood isn’t a great option even if you give it plenty of gate service. Regular wood is better, but you still have to watch for freezing conditions. Water can get into small cracks in the wood, expanding when it freezes and widening the cracks, weakening the wood overall. Prepare for a lot of maintenance service. 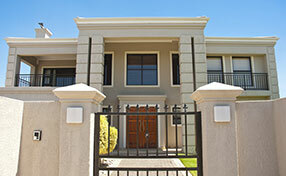 Wrought iron is perhaps the best-looking material, but it’s also temperamental. 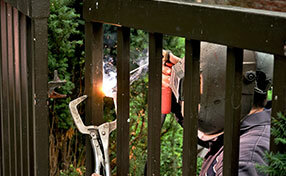 You’re going to need hinge welding repair fairly often, and corrosion is a real problem. Rust is going to be your constant enemy with a wrought iron gate. You also have to be very careful to select the specific type of wrought iron – a large percentage of the material isn’t weatherized and doesn’t have powder coating, which means it’ll basically fall apart under adverse weather conditions. Metal systems, often on rollers, are the cheapest but also the heaviest. You really need to be careful trying home repairs with them – have 24/7 emergency repair on your speed dial and don’t take them off the rollers yourself!